Free Spirit Publishing, 9781575424279, 22pp. Calming and restful, this book highlights the quiet moments of baby’s day. Fussy baby, take a break. You’ll feel better when you wake. Tired baby, close your eyes. Mommy sings a lullaby. 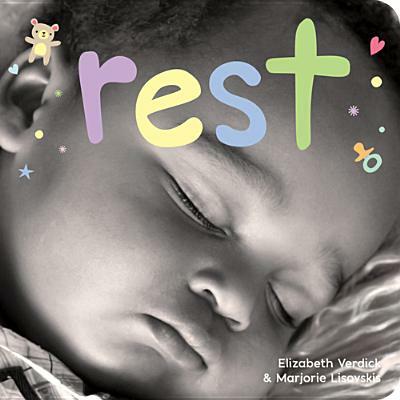 The appealing black-and-white photos and captivating illustrations of sleepy and sleeping babies combine with gentle, rhythmic text to soothe baby into quiet, peaceful rest. Elizabeth Verdick is the author of more than 40 highly acclaimed books for children and teens, including books in the Happy Healthy Baby and Toddler Tools board book series, the Best Behavior series for young children, and the Laugh & Learn™ series for preteens. Her most recent titles include Reach (Happy Healthy Baby), On-the-Go Time (Toddler Tools), Bystander Power (Laugh & Learn), and The Survival Guide for Kids with Autism Spectrum Disorders (And Their Parents). Elizabeth’s daughter and son are the inspiration for nearly everything she writes. She lives with her husband, two children, and five pets near St. Paul, Minnesota. Marjorie Lisovskis is the editorial director at Free Spirit Publishing. Along with the Happy Healthy Baby series, she is the coauthor (with Elizabeth Verdick) of How to Take the Grrrr Out of Anger. She has been writing and editing books and activities for children for more than 30 years and has a special interest in creating books that help young children see themselves as confident, capable, and loved. Marjorie has two grown children and three grandchildren. She lives with her husband in Minneapolis, Minnesota.